It was GRAY/Green Day when we first woke and saw the sky. GRAY. Thick, dense clouds slowly rolled our direction and then rain, sometimes heavy, drenched our tents and us. The kids had question marks written all over their faces. Do we stay or go? Can we climb in the rain? Can we bike in the rain? It’s the desert; it’s the southwest trip, so the answer is pack your packs and hit the vans. We go! It didn’t take long for streaks of sunlight to crack through the cloud cover, so all activities resumed, and we all got in our last big day of action. You can see the story from the many pictures we’ve posted. Road biking, mountain biking, and climbing. 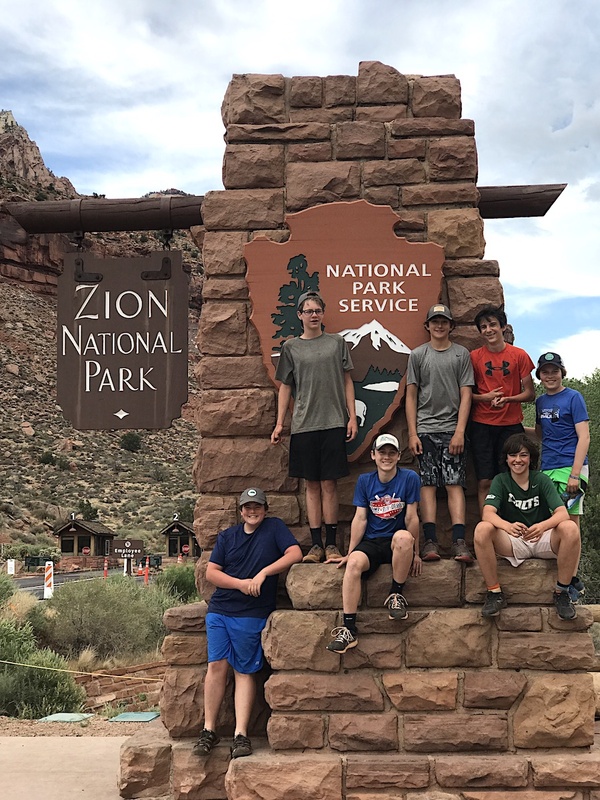 All participated, and all learned something along the way about Zion, themselves, and each other. This crew is a well-oiled machine now, so getting here and there for what happens next is a breeze. A campground intermission involved packing prep for our EARLY up and out of Zion for the airport tomorrow. We will be packing in the dark tomorrow morning with over 60 groggy adolescents. Should make for one more Zion adventure! Cleaned up and presentable, to town we went for Pizza Noodle, our delicious last supper together. You can see it was the clean plate club after a full day of spent energy. Re-carbed, we found our fifth wind, but tonight is a wind-down. Kids are in their nightly camp routine of games, songs, and storytelling, and soon we will have our final camp fire when we all say goodbye. Not forever but for a little while. There is nothing like this trip. Sometimes people who say, “We’ve been there already,” or “I already do all that stuff.” It doesn’t matter. This trip is different. The place and the adventures are a backdrop for the real magic that happens between all of these wonderful people, some grown up and the rest still growing. The truth is we are all still growing, and the love and friendship that happens here enriches us all. This trip sticks to the bones of all who are fortunate enough to know it. You can’t forget it because it becomes part of who you are. If you are a parent reading this blog post, then thank you and congratulations. You have given your child an opportunity most never come to know. We will be home soon, and your child will hug you, and you and your child will know what that hug means. This blog was our virtual hug to you too. Hope you enjoyed seeing the product of your love and labor. They are ALL amazing individuals who are on their way to do amazing things for themselves and our world! TEARING IT DOWN. Practice makes perfect, and we are officially the most efficient, large-group campers in the southwest! Yesterday was a transition day from the Grand Canyon back to Zion, and once again, this crew nailed it. These pack, drive, and restock days are so valuable in terms of building this team and cementing relationships. Moving over 80 people takes focused determination, with all hands on deck. This group of kids knows how to work together, and they make days like yesterday another day of awesome. The drive from North Rim back to Zion takes about two and a half hours. It is enough time in the car for everyone to take a quiet breath, reflect on their time, and really process what is going on in their lives right now. We listen to trip music, compliments of Mr. Schwartz who compiles 7 CDs with songs we all recommend for the Southwest playlist. And we talk. We tell funny stories. We laugh. SO MUCH. We talk about TLS, and we talk about what’s next. Expectations. Nerves. Goals. It’s meaningful time. After dinner, we ventured into town for some walking and gawking (and ice cream). Some kids shopped, bought souvenirs, while others just hung out and took it all in. Springdale is a cool, park town. It’s nice to just sit on a bench or on the lawn of Pizza Noodle and take it all in. GEARING BACK UP. Today is our final day in Zion. Well rested, we gear back up for more physical adventure. We will split groups again and do some off-road, on-road biking and back to that giant rock for more climbing. Tonight we eat out! No more cheese quesadillas! It is a grand finale dinner in town followed by a full group camp fire. The last fire, we bring the whole experience full circle for what is one of the most memorable (and moving) moments of this trip. We’ll keep adding pictures as we can. Thanks for coming back and checking on us. Everything is going great! We’ll be back before you know it. Have a great day! Former TLS teacher, Joe Griggs, gave this day its appropriate name. It is a day of awesome and an awesome day for lots of reasons. #1 We CHILL. We got to sleep in! Every morning is Zion is up and out by 7:30 AM. We pack our days full of rigorous activity, and camping in and of itself is hard work. You don’t just throw the cereal bowl in the dishwasher or run to Panera for lunch. Everything is an ordeal. Here we take our time. We shower! We sit around a morning fire and talk. This part of the trip is slower-moving on purpose. We wake up more casually, take our time with breakfast, leisurely pack our lunches. It is a time when we relax a little, and it is awesome. #2 We HIKE. We pack a lunch and hike 3 miles out to one of the world’s most beautiful wonders–the Grand Canyon. It is impossible to describe the view. It is simply SUBLIME. Our precipice picnic is fully charged with wonder. How did that happen? How far up are we? How far can we see? It is an unforgettable moment for all of us as we take pictures and try to take it all in. #3 We PLAY. Back at camp we play. We play word and card games, soccer, ultimate frisbee. We sing. We talk. We cook. And we prepare for the TALENT SHOW. A Grand Canyon tradition, the stage is a gravel section of the parking lot our tents surround. The vans provide our spotlight. It is the most hilarious and fun utter lack of inhibition, and the teachers tend to be the ringleaders! We laugh and laugh and laugh. It is awesome. Back tomorrow with more details, but keep checking back here later today for more photos. As we get closer to Zion, our service improves and we can upload more for you to see. Have an awesome day! Yesterday was BUSY! We packed up camp, leaving no evidence of our existence behind (leave no footprint), and we ventured to a beautiful swimming hole for a refreshing wake up before taking to the vans for a several hour drive to the Grand Canyon. The kids seemed ready for the restful ride through the desert with a quick grocery stop and then up the rim to the chilly alpine village we built for ourselves. We unpacked and set up our Grand Canyon tent city, cooked dinner, and then took a short walk to the edge of the campground where we lost our breath at the first sight of the truly GRAND canyon. Add sunset to one of the world’s wonders, and you have a vista that you’ll never forget. Photography simply cannot do it justice. Also impossible to capture in this blog is the community that we’ve built out here. The kids and their teachers have bonded in a new and different way. The kids are starting to understand what it all means, TLS, their friendships. They are connected as graduates, pioneers, and now lifelong friends. And they are grateful. Gratitude is thick in our high altitude air. Today is the “Day of Awesome!” We will pack a lunch and hike to one of the most beautiful places you can ever imagine eating a sandwich. Tonight is a special night at camp, one we will share tomorrow as our wifi connection is too weak to do it justice in just words. We will add pictures as we can from yesterday (these two are the only ones we were able to get uploaded from here), so check back later today. Once we are back in Zion, the pictures will come, and you’ll see clearly what a day of awesome is. Morning woke us today to quick action. Third full day in the desert. Our routine is in place. Breakfast… pack a lunch…pack water…pack your pack! Camping requires lots of packing. To the vans, and off half of us drove in one direction, the other half to somewhere completely different. CLIMBERS drove 30 minutes to giant rocks that rise from a lava base and grassy green valley floor. Checkerboard mesa is on one side of the valley, and a solid sandstone rock face on the other. It’s a dramatic and beautiful contrast. Our kids listened carefully and took it to heart. Everyone participated in this rigorous activity in one way or another, and as is typical with this journey, kids surprise themselves on this rock. Those who are most intimidated are often the ones who shine and climb with ease to the top of the rock face. Also typical of this group, they rooted for each other, helped each other, and some made it to the very top of almost every ascent. Each experienced the Zen of the rock in his/her own way. DESERT BIKERS. Game and ready for the challenge, most experienced something completely new. Desert trails are narrow and rocky. There are steep inclines that lead to fast descents. You have to work and ride with courage. It is a blast as you dig in, get present, look around you at the vast open space, and let the warm wind rush in your face as you breeze down the trail. And that’s exactly what this crew did, and their hard work and great attitudes were rewarded with a surprise ice cream treat as they drove back towards camp. Honestly, it was a euphoric day that started and ended with a beautiful weather, a bath/swim in the river, card games, songs, soccer, and camp supper (and some faculty HAIKU). We are happily tired once again, ready for another day of shifting gears once more. Tomorrow we pack up camp and move to a completely different environment. It is a swift transition that will keep us on our toes, with eyes and hearts open for the next big adventure. Get ready with us. We’ll be back when we can. NOTE: The Grand Canyon has VERY poor reception. Photos will be limited until we resurface. Good night! Today was another big day of hiking the narrows and canyoneering, so we were all up early and back at it. Like yesterday, groups scattered all over this amazing park to various finger canyons with trickling water, large canyons with rushing water, undulating limestone canyons with sand slides, short rappels, long rappels, small escapades and large adventures. And still, these kids have energy enough to set a table for dinner with decorum fitting of the royal court (see pic)! The pictures prove the experience. Kids are getting after it, trying new things, challenging themselves. What you can’t see in full is the immense support and friendship behind these scenes. Not every kid is comfortable with every activity on this trip. This is a trip that requires stretching in some way for each person every day. Yet these kids and teachers are family. They rally behind each other; cheer each other on. In fact, every night when we get back, just before we get ready for our tents, we meet as a group for “Shout Outs.” This is when the kids say something positive about each other or their teachers or guides, when they stand up and say, “I want to give a shout out to _______ because she helped me with my gear when I wasn’t really sure how to manage it,” or ” Shout out to ________ for cooking us an awesome dinner tonight…” Sometimes this ritual is so sweet, you can see some eyes well up around the circle. River baths, camp suppers, circle games, card games, football, and more…As the sun sets, the energy finally wanes, and soon all will retire to their tents to whisper about their days and to prepare for tomorrow. Tomorrow we shift gears, both figuratively and literally…biking and rock climbing are next. More adventures to come! That’s just how this trip is. Kids are present in their fortune to be here, so they are game. They’ll try it all, and even if they are uncomfortable in the moment, they feel the reward once they’ve accomplished the difficult. The Narrows: Usually hiking is pretty simple, but hiking through chilled, rocky water adds a level of challenge that is tougher than it looks in the pictures. The canyon is made for curious people, which luckily we are! Every five feet, there is something new to see, a nook or a cranny, a hole in the wall, a small cave, wildlife, a trail off to the west—where does it go? Our kids and teachers gobble this stuff up, and today was a Zion Chamber of Commerce day thanks to the glorious sunshine and moderate temperatures, so we took full advantage. The van rides back to camp were quiet this afternoon. Kids slept. They looked out the windows and took it all in. They reflected. They were tired in that good way that feels accomplished and grateful. Tonight, they cooked, played games, laughed, shared stories of the day, and soon they will take to their tents and they will sleep hard. Tomorrow will present another day of awe-inspiring challenge, and it will be “the coolest thing I’ve ever done in my whole life” for a few more enthusiastic adventurers. Stay tuned! Three different flights, three different groups, all different layovers… ONE delay, but all arrived in Las Vegas ready to roll! This is a journey after all, and waiting is part of life. It was dark when we got to the Lexington airport. Groggy kids heaved thick duffles while parents huddled to watch and wonder how their child would possibly survive without their phones, their beds, and their parents (in that order probably)! 61 students and 17 adults are headed out west for the trip of a lifetime. On the various airplanes, some slept, but most snacked, chatted, and played card games, excited for the next leg of this 8-day journey. We will get into van groups, jump into minivans, and travel for four hours to Zion. We’ll picked up some food along the way. We will look like a mini-van commercial—imagine a rainbow of 10 vans queued on the open Nevada road. And on this open road we will listen to music, tell stories, talk about the past, present, and future. It’s a road trip! On the way to Zion, we will stop off at the grocery, a shopping collaboration extravaganza. Cook groups are responsible for their own meal planning, so watching their collective brain power weave through the grocery aisles selecting healthy camp dinners and lunches is very entertaining. What will the budget allow? Chicken, tortillas, hot dogs, ramen noodles, pancake mix, apples, granola bars…no pop tarts please! Finally, the cart will fill and off we’ll go to the next and final stop for today, the campground. Unpacking and setting up camp is unforgettable. 61 people will come together to carry, unpack, and build a tent village. It feels a bit like a barn raising as little by little there is progress and then VOILA! We all have shelter and structure to stay. And we realize this is really happening! Next, we’ll cook, play a little, meet to discuss tomorrow’s big first day of activities (hiking and canyoneering), and then off to our sleeping bags we’ll go. After a full day of travel since the wee hours of the morning, those bags will feel like the most luxurious bed we’ve ever known. We will do our best to report the day’s events each day right here on the blog (the morning after). For now, our photo journalism will be abridged as the reception is spotty and uploading media is tough. Please be patient. We’ll have lots of great pictures to share when we return. You guys are a well oiled machine. Have a great time out there. I am so excited for J to make this “career ending” trip. I am sure that this will be an adventure to remember, with “family” he has grown to love. Awesome Adventure. Exciting Experience. Forever Friendships. Have fun! We love you guys! School is quiet without you! This is the most amazing team building, end of the year fun! I can’t wait to hear all the stories of adventure! Thanks for taking care of them and sharing all you knowledge! Love the pics and all the smiles!! My older two still talk about their SW trip and what an amazing experience it was. Enjoy!! Looks like a great time! Thx for the pics and the supervision. Have fun. Be safe! love reading the blog and seeing the pictures! What fun! Thank you!! The posts–and the pics–are so beautiful. Thank you for letting us parents live at least a little vicariously! Thank you for changing our kids lives forever, I will be forever grateful how you have impacted my child. This week was a blessing for all, a memory to be cherished and shared for years to come. Big thank you for the teachers and staff. Pictures look wonderful.